In addition to removing any clumps of dirt and drying off the head, digging tools need to be kept sharp so they're easy to work with. Depending on how much digging you actually do, this can be a once a year job or once a month. If you need to dig through any roots it's nice to have a sharp shovel. When sharpening a shovel you only need to sharpen the upper edge of the shovel. A straightforward way to do this is to fasten the shovel into a large vise with the head near the vise and facing up. Start at one side of the shovel and holding your file at a 45-degree angle to the edge of the shovel and pointing towards the middle make four or five strokes. Move your file in an inch or two towards the center and repeat the motions until you get to the middle of the shovel. Once you reach the center, move over to the other outside edge and once again work your way back into the middle of the shovel. Once you've sharpened the shovel, spray it with oil or a lubricant and wipe all over the surface with a cloth. The oil will prevent the fresh edge from rusting. Sharpen hoes in the same way. Use a file on one side only; work slowly from one edge to the other and finish by giving the head a quick run with oil to prevent rust. Gardening is a hobby shared by many. Working out in the yard allows you to appreciate the warmer months. You will get a good work out and enjoy the fresh air. All you need are a few essential tools and your job will be easy. Once all your hard work is done, your yard will be the envy of all. Now all you have to do is sit back, relax and enjoy your surroundings. 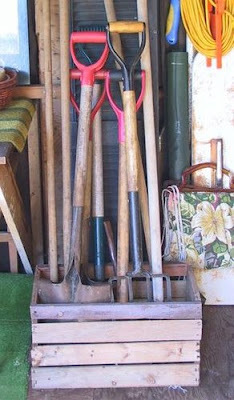 Many friends asked me that do you have some ways to keep garden tools always working. Actually, there is no real secret. As the old sayings that if you take care of your tools they'll take care of you. What you need to do is buying good quality tools to start with, then take proper care of them. So if you are industrious enough to get rid of rust and properly maintaining your tools, you will keep them working for years. 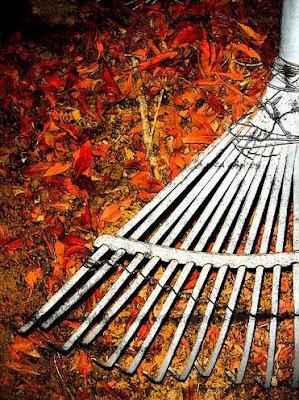 The wooden handles of rakes, hoes and shovels need maintenance as well. Over time, the wood will dry out and begin to splinter. You can ensure the wooden handles of your garden tools don't ever do this by sanding the handles with medium grade sandpaper (100 grit) and then rubbing the handle with linseed oil. You can do this anytime of the year, but it provides extra value when you are putting your tools away for the winter. Cold air tends to draw moisture out of the wood so the extra protection provided by the linseed oil keeps the handles from drying out and splintering. Gardening books or magazines will give you lots of innovative ideas about things you can do to maintain your gardening tools. Things like putting your long handled tools into a capped plastic pipe filled with linseed oil or storing your digging tools head down in a bucket of sand that's had a quart of old motor oil poured in. Undoubtedly these ideas will work, but when you think about it, all you're trying to do is prevent the handles from drying out and the metal from rusting. You don't really need to go to those extremes, just follow the basic ideas we've talked about here, and you'll be working with your garden tools for years to come. These are some of the common maintenance tips to extend the life of garden tool, however you should ensure that the edges of the tools are sharpened so that you feel comfortable while gardening. Well-maintained garden tools will have extended life and at the same time you will enjoy frustration free gardening. Gardening has always been an excellent hobby for relaxing, being close with nature, and a great way to reap the rewards of hard work and dedication. However, in order to have the absolute best garden possible, it's important to use the correct tools for the job. The specific gardening tools that you will need will largely depend on the type of garden you have, and what type of plants, vegetables, or flowers you are trying to grow. The main enemies of all garden tools are moisture (causes rust), and poor or inadequate maintenance that prevents them from doing their job properly or cause them to wear and break. So, the trick to maintaining your gardening tools is to prevent moisture and wear from attacking them. Here are some basic fundamentals for keeping your gardening tools around for a long time. - Before putting them away for the winter clean them well and give them a coating of oil. - At all times get rid of the dirt after using the tools and clean thoroughly. 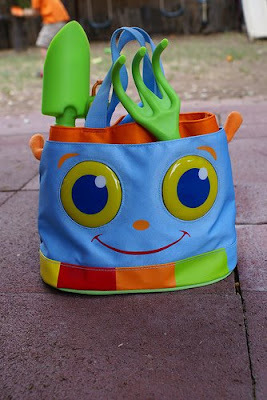 - Completely wipe dry the tools before packing them. - If the tools contain any chemicals like fertilizers ensure they are totally washed clean. 1. Starting from the top, you need to protect your head. Body heat escapes through the head, and in the cold weather, a warm hat should be worn. Knit yourself a 'gardening crazy' hat or buy a simple woollen hat on the high street. And in the summer, even more attention should be paid to the head. The sun's rays are not only hot but they actually burn you. We all know this, but how easy it is to forget when you want to soak up the sun after months of grey or cold weather. Invest in a cool sunhat. Not only will it help protect you from sunstroke, it will also protect against the drying out of your hair and skin. 2. Keep one old comfortable jacket or short coat, preferably with fairly large pockets, especially for the garden. When you're working, you won't need to worry about dirty marks. Leave them there, it's all part of the gardener's designer uniform! 3. Suitable trousers. Again, keep a couple of old pairs especially for gardening. Wear heavy duty jeans for heavy duty work. A good waterproof pair are handy in damp climates. In fact, in damp climates, a whole waterproof gardening suit is invaluable. There is always planting to do in the rain, and a waterproof hat, jacket and trousers tucked in a pair of boots will keep you nice and dry! 4. Protect your hands. For light work, potting on or pinching out tomato plants, a disposable plastic pair of gloves or a pair of kitchen rubber gloves will be enough. For heavier work - pruning roses, weeding thistles and nettles, wear heavy duty gardening gloves, or your hands will suffer. 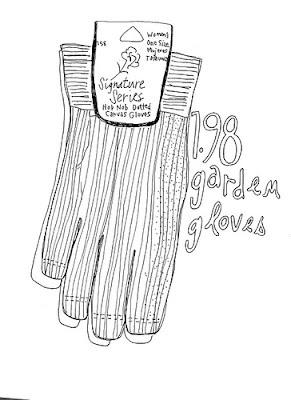 General-purpose glove for performing a variety of tasks around the home and garden. They offer good comfort and breathability. Quilted style is good for heavy, multi-purpose applications and added heat protection. Chore gloves are for general purpose work. Some gloves may be marketed for specific tasks, such as garden gloves with patterns or designs to attract certain types of buyers. May be cotton or cotton / polyester blend, canvas, jersey or terrycloth. Often has a knit wrist. Some styles may have PVC dots to improve gripping ability and durability. The target that we want to achive is beautifing our gardens while to be a fashion gardener. The above 4 garden fashion tips will make your life a lot more comfortable, and safer. There are so many types of gardeing tools that we are not know well. As a modern man, we always like have a house with a garden. So having the right gardening tool is an essential element of successful gardening. According to gardening equipment reviews this is one of the most vital gardening equipment. It has been classified as a must have for gardening freaks. The purpose of this equipment is to trim the hedges and for pruning of plants. All garden shredders are equipped with powerful motors and a silent crushing system. This type of gardening equipment helps in improving the pace of the shredding activity. Garden shredders which use electric motors are very easy to handle and relatively easy to assemble too. This type of equipment is best suited for pruning trees and for making hedges that look beautiful. It can be used up to a maximum height of 40mm. This tool is considered as a pre-requisite for gardening connoisseurs as it comes with a plunger and built in wheels. Cultivators are relatively modern garden tools that help in cutting hard soil. They come with patented tines to help with cutting through the hard soil easily. This equipment comes with border edger. It is also the perfect equipment that to be used for jobs like thatching, aerating and clearing the moss. It is also extensively used in the preparation of flowerbeds and vegetable plots. Before you plant anything, you will need to open and improve the soil. A spading fork looks like a pitchfork but has a shorter handle and wider tines. It is used to dig down into hard soil and break up the ground. 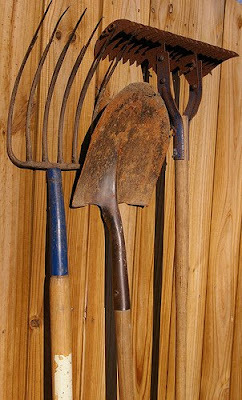 A hoe is useful for weeding and cultivating the surface of the soil to allow for penetration of nutrients and water. Long nozzles allow the water to come out at a very gentle flow rate and are useful for reaching across long distances. Select a watering can that has a detachable spray head - this type of watering can is perfect for watering young seedlings. At last, there is a tip for you that don't buy the most expensive tools when you are just starting out. You may find that you don't really like gardening - and if that is indeed the case, you will not have lost a large investment. I believe that there are so many people like me that do not know all types of hand tools well. So here I will introduce those people some simple hand tools. It can be frustration knowing exactly how to use these tools safely and with minimum risk to yourself. If you have a desire to work with wood and make things that you can use in your home or to sell for an extra income, you may be overwhelmed with the amount of items that are available for wood working. When you are using hand tools and hand power tools, keep in mind that while these tools can be dangerous, they are merely tools to enable you to get your wood working project completed in a more efficient manner. Keep these tips in mind when you are working with hand tools and hand power tools. Hammer - It is used for the striking force in order to break or to deform an object. The types of hammer include the claw hammer, power hammer, sledge hammer as well as the bell pein, cross pein pin hammer and much more. Drills - Drills are a somewhat boring type of hand tool, which is used for creating holes in walls as well as in wood. There are some types of drills such as a hammer drill, air drill, press drill, percussion drill and power drill. Screwdriver - This type of hand tool is used by loosening or tightening a screw. This is done by the aid of the tip of the screwdriver. It comes in different types and sizes and some of which are flared and slotted. Sander - This is used for smoothing out wooden products. There four types of sanders such as the air sander, sheet sander, orbital sander and the bench sander. Spanner - The spanner is a hand tool used to loosen and tighten the bolts and nuts. It has different varieties such as open-ended C spanner, offset ring spanner, ring spanner, adjustable spanner, tap spanner, box spanner, and split ring spanner. Wrench - This hand tool is used for gripping the fasteners that are loosened or tightened through the jaws of the wrench. The types of wrenches include the pipe wrench, torque wrench, footprint wrench and the strap wrench, along with the mole wrench and the stilton wrench. Clamps - These tools are used for holding instruments throughout processes like woodworking, carpentry and so on. 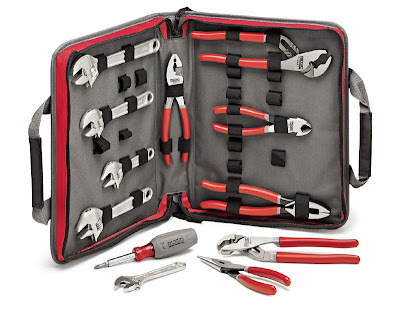 Like any other hand tool, it has different types such as the G clamps, power clamps, pipe clamps, web clamps, action clamps, mitre clamps and much more. Saw - This is a hand tool that is more commonly used by carpenters in order to finish their work efficiently. Saws also have different varieties which are for different purposes such as plywood saws, Ryoba saw, utility saw, azebiki saw and much more. I hope the above introduction can help you to choose the right hand tools, which is only the start to ensuring your have a good time with your new woodworking hobby. Proper care and maintenance, buying quality tools and adhering to safety standards will allow you to have the best possible experience. 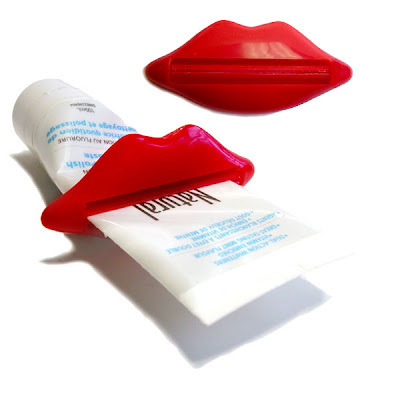 Do you have the trouble in squeezing the toothpaste when finishing? Everyone knows it’s much easier to press a full tube of toothpaste. The toothpaste squeezer gently turn this key and your tube’s always fat. This “vise” thoroughly presses every remaining ounce to the top of the tube, making it so much easier to squeeze. Who doesn’t want to save pennies – especially when it’s this easy? Just slide a toothpaste tube into the top of this toothpaste squeezer and twist the knobs to roll it up. The roller efficiently and neatly squeezes the contents of the tube, making sure every last bit gets used! Do you like eating western food? Do you have the trouble in puting the flatware after eating? Flatware was one of the most important parts of setting a table. 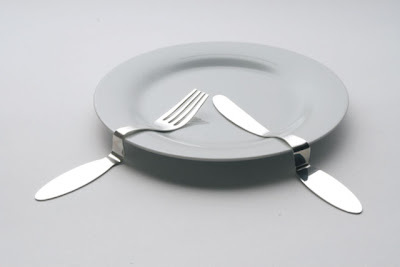 The above knife and fork are designed by Kathryn Hinton specially for not staining the table cloth. But many people call the function of the flatware in queation. You know the bending handle may be not easy using. The purpose of design should be base on its function. Some people think that it is better to straighten the knife and fork when using. Then magnetic wristband - Handyman’s Helper is for those handymen like my grandfather. The ridiculously strong magnet in this MagWear holds onto hardware, small tools and other metallic objects… It’s so strong you can actually pile the hardware on in layers. Perfect for working on ladders, in crawlspaces, hanging pictures, under cars, or in any situation where you don’t want to loose your stuff. Velcro strap can accommodate even the thickest of wrists. Available in Coral Red, Periwinkle Blue, Orange and Grey. Comes packaged in a decorative box for easy gift giving. Magnetic area is 3" x 4" square; 3/4" deep. Click Select Style below to choose color. Yellow and Green are discontinued. A can opener is a handy tool to open up any cans but in today's scenario it is not that easy to choose from the wide verity of openers available in the market. The basic purpose of this tool is to open up the cans with ease but the new age devices not only complies with its basic duty but also performs a beautiful decoration. 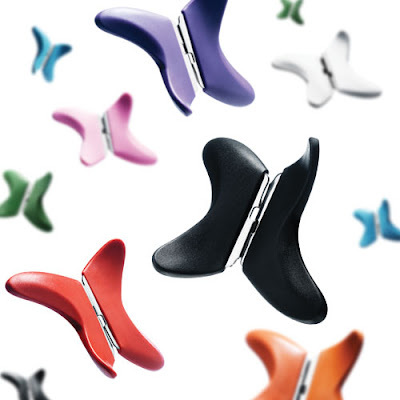 The Butterfly can-opener was born from a wish to created a kitchen utensil that was both ergonomic correct and easy to find. Early prototypes. The two designers would give everybody that visited them a lump of clay in the hand - and were asked to squeeze it. The result was a blueprint of how different hands would “get a grip”. The different shapes were then molded into one common shape. To make it easy to find in any kitchen drawer the two designers came up with 8 different colors - making it very easy to spot among the other kitchen utensils. 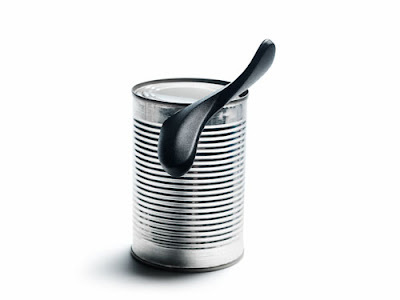 Bonus info: The first tin cans, invented in 1810, were heavy-weight containers that required ingenuity to open, using knives, chisels or even rocks. Not until cans started using thinner metal about 50 years later were any dedicated openers developed.